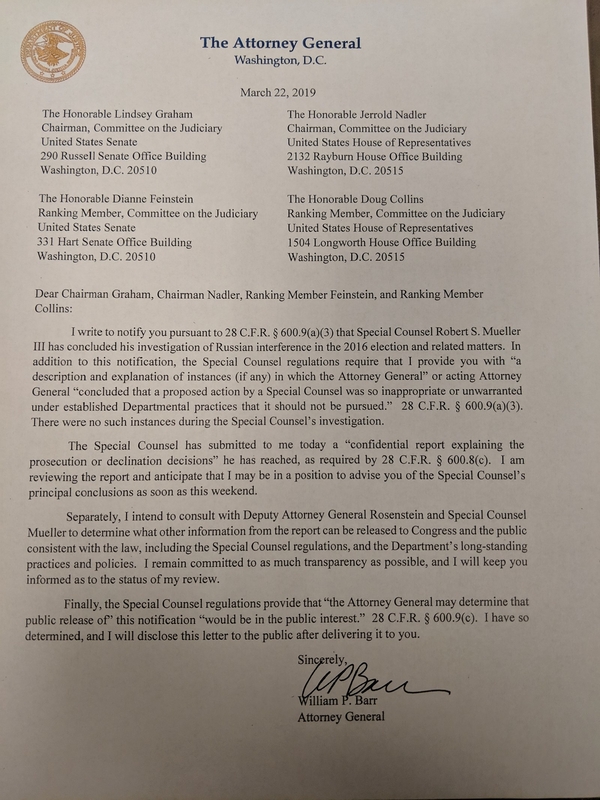 WASHINGTON — Special counsel Robert Mueller has finished his investigation and submitted his report to Attorney General Bill Barr, according to a letter that Barr sent to congressional lawmakers on Friday, ending the most politically significant criminal investigation in decades. Mueller is not recommending any further indictments, according to a senior Justice Department official. The official would not comment on whether there are any sealed indictments pending related to Mueller’s investigation. What exactly Mueller said in his report isn’t public — yet. Barr will have the power to release Mueller’s findings in the future, but for now the document is secret, as required by federal regulations. Barr wrote that he is reviewing Mueller’s report and “may be in a position” to advise Congress on Mueller’s “principal conclusions as soon as this weekend.” Barr’s submission on those key conclusions is expected to be public, according to Justice Department spokesperson Kerri Kupec. Barr also wrote that he planned to consult with Deputy Attorney General Rod Rosenstein and Mueller to decide what other information from the special counsel’s report can be made public. Kupec told reporters that Mueller’s report is “comprehensive,” but declined to comment on the length. She said that few people have seen it, but declined to say who exactly, besides Barr and Rosenstein. Kupec said that Rosenstein would be calling Mueller, if he hadn’t already, to thank him for his service. A security officer from Mueller’s office delivered a hard copy of Mueller’s report to Rosenstein early this afternoon, and Rosenstein then gave it to Barr, Kupec said. Emmet Flood, a senior attorney in the White House counsel’s office, was notified by phone by Barr’s chief of staff Brian Rabbitt that the report had been submitted at around 4:35 or 4:40 p.m., shortly before Barr’s letter was hand-delivered to the House and Senate Judiciary committees by Stephen Boyd, who heads the Office of Legislative Affairs at the Justice Department. An electronic copy of Barr’s letter was also sent to House and Senate leadership. Although Mueller’s investigation is over, Mueller is still special counsel — he and a small contingent of staff are working to wind down the office, Kupec said. He’ll remain special counsel until a time to be determined by Barr, she said. On Capitol Hill, lawmakers responded to news that Mueller was done with renewed calls for transparency. Trump submitted written answers in response to questions from Mueller’s office, but did not sit for an in-person interview, according to Trump’s legal team. Under federal regulations, Mueller’s report to Barr is “confidential,” but Barr will have discretion to make all or parts of it public. In a rare show of bipartisanship concerning the special counsel investigation, the House of Representatives voted 420–0 on March 14 to urge Barr to make Mueller’s report public. It was a resolution, which isn’t binding on the Justice Department but reflects the intense public pressure on Barr. Read more about who was charged in the Mueller investigation.